Source: Written by Dirk Willem te Selle, Enschede, NL, based on conversations with Thea te Selle – Loonen, March 2005. In former times the water mill consisted of two parts, namely a corn mill and an oil mill. At many places in the Achterhoek region of the province of Gelderland and in the region of Twente in the province of Overijssel one can come across this double function of water mills. In the oil mills oil was produced out of linseed, rapeseed, rutabaga seed and camelina or falseflax. The oil of this last plant, however, had an offensive smell and therefore it was only used as oil for lamps and for the maintenance of leather. The pressed linseed breads still were an excellent (livestock) fodder. The corn mill mainly ground rye, oats, and wheat. 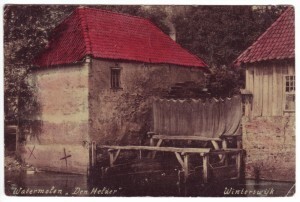 Water mill “Den Helder” has had several owners in the course of the centuries. The mill was in the ownership of Jan Helder at the end of the 19th century and since then the mill has gone by the name of “Den Helder”. After Helder’s death, his widow re-married in 1897 Barend Gerhard Heusinkveld. Barend himself was the owner of the windmill Fortuna at the Misterweg (Road to Miste) in the village of Winterswijk and left the work at the water mill to a family member. Later on, he changed ownership and sold the water mill. On the 7th of June 1922 notary Jan Berend Roelvink on the same occasion put up for auction and sold both beer- and coffeehouse Den Helder and the Plekenpolsche or Keupen water mill of Barend Gerhard Heusinkveld. 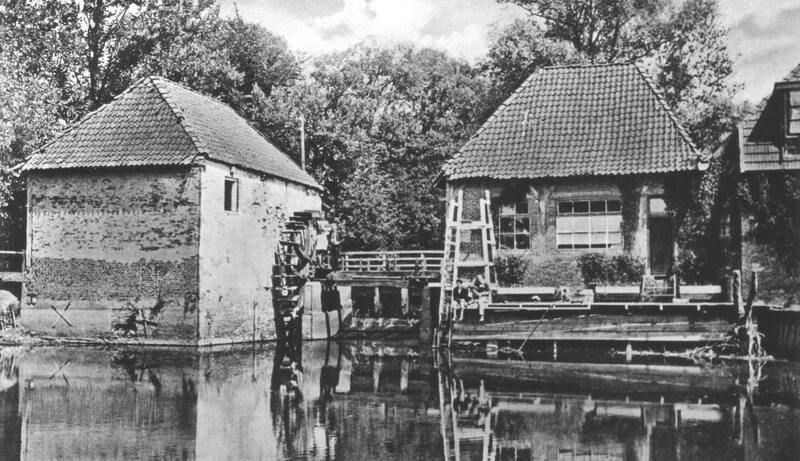 The water mill was sold for a price of five thousand and 200 guilders to Derk Jan Berenschot, the owner of the “Nieuwe Molen” (New Mill) situated further downstream the Slinge. With this purchase, Derk Jan Berenschot very cleverly cut out a competitor and he never worked again with the oil mill and corn mill of Plekenpol/Den Helder. 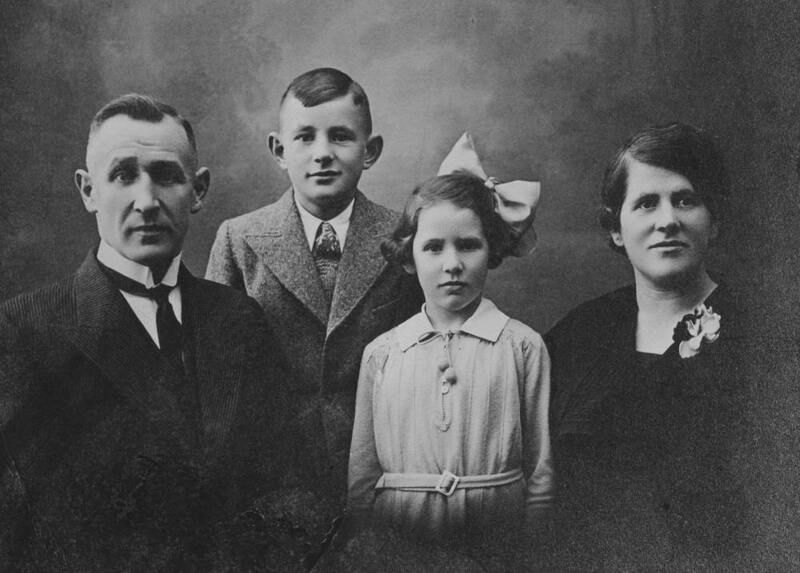 Between the Te Selle and Berenschot families, profound relationships existed. Jan Albert te Selle at farm “Fökkink” married Willemina Berenschot in 1884. She originated from “Nieuwmolen” (see Genealogy). Jan Albert’s brother Derk Willem te Selle married her sister Theodora in 1885, one day before Christmas. When Derk Willem fourteen days later suddenly passed away, their baby was already a few months on the way. Dina Willemina is also born at “Nieuwmolen” in May 1886. Next Theodora marries again with another Te Selle and this time with brother Bertus Jacobus. Four more children are born. The first one is my grandfather, Derk Willem te Selle, and the youngest one is Thea’s father, Johan Christiaan te Selle. It may be very clear now to whom we owe our first names! Derk Jan Berenschot soon sells the water mill in two parts. Initially, the corn mill is still in use by Heusinkveld, so the oil mill is sold separately in 1923 to Johan Christiaan te Selle and Geertruida Johanna van Eerden – te Selle, Thea’s parents. On the 26th of August 1927, Derk Jan Berenschot also sells the corn mill. Bertus Wassink becomes the new owner for the amount of five thousand guilders. The purchased mill can be occupied on the 1st of January 1928. One of the conditions in the contract of sale was that the neighbors living behind the mill were allowed to use the already existing roads in the future. Moreover in the contract of sale with Wassink was very clearly inserted that for the purchased property a ban was imposed on grinding, so that it was not allowed to use the mill for that purpose. Johan te Selle did not possess the “right of way” across the bridge and from time to time he and Wassink had a quarrel about that matter. 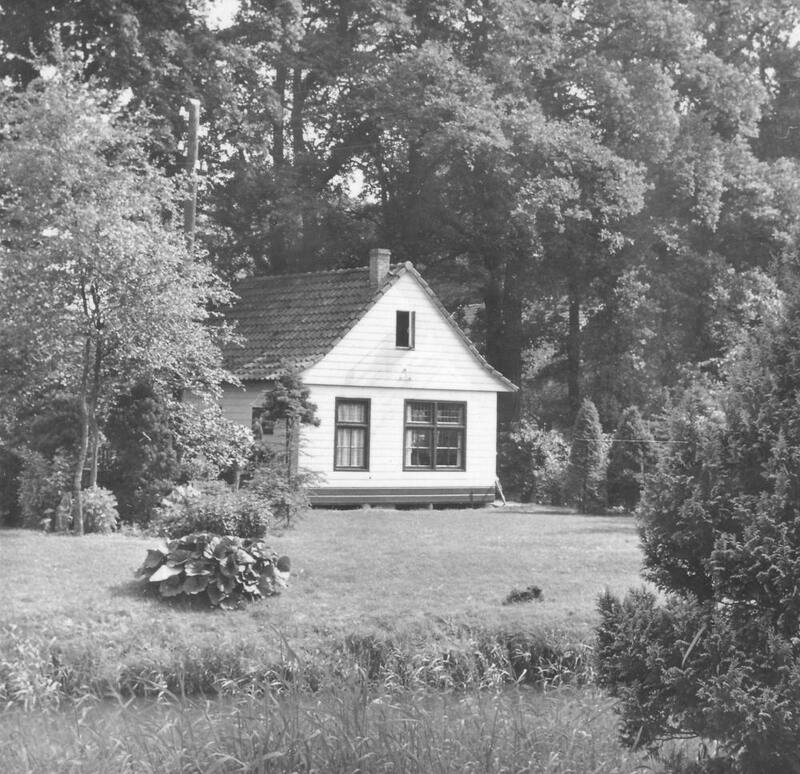 Jan Bertus Wassink, however, sold in December 1929 to Wilhelmus Petrus Bausch the house with café Den Helder, the water mill with the “right to dam up” the land behind the house and along the river and also the road – as wide as five meters – towards the Woold gravel road, as well as garden and meadow across the brook, altogether 1.10.60 ha (2.73 acres). Once Bausch had arrived and settled he and Johan te Selle entered into an agreement about the “right of way”. Before that time Johan had to create himself a way out along the Slinge brook and past farm Schot Schepers. During the late twenties, the waterwheel of the oil mill had already disappeared and in the thirties the wheel of the corn mill as well. At the time of the arrival of Wilhelm Bausch in 1929, the corn mill’s wheel was still intact. He conceived a plan to use hydropower in order to supply his business with self-generated electricity. After the rebuilding of the house in 1934, he had a dynamo (generator) installed in the mill. He bought this dynamo from the former “Zuiderzeewerken” (a huge polder project in the center of The Netherlands). The new hotel-restaurant even would be heated electrically. Unfortunately, Bausch did not have at his disposal any way to store the generated energy, and in addition, it turned out that strength and quality of the current did not fit domestic use. Time and again the fuses were blown. On pleasant summer nights, however, this private power station provided for an atmospheric light show in the adjacent garden! 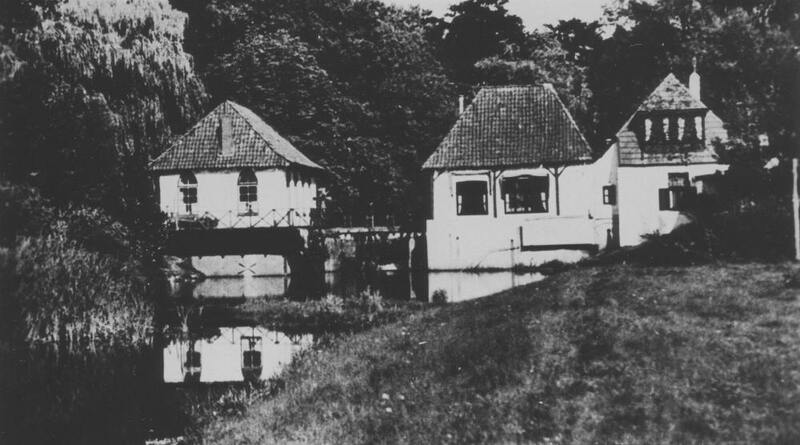 During the renovation of the water mill after the Second World War, both mill wheel and dynamo were removed. In the middle of the 1920’s, long before the Second World War, the southern part of “Den Helder”, the old oil mill, was purchased by Johan and Trui [Gertruida] te Selle. 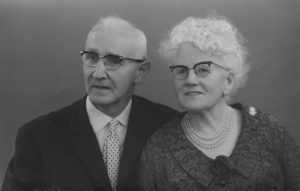 On the ninth of August 1925 their son Bertus Jacobus was born in the new place. Johan was a carpenter and contractor just like his older brother Derk Willem. He got busy at the old mill setting up his carpenter’s workshop. Daughter Thea still has good recollections of the oil mill and the house. 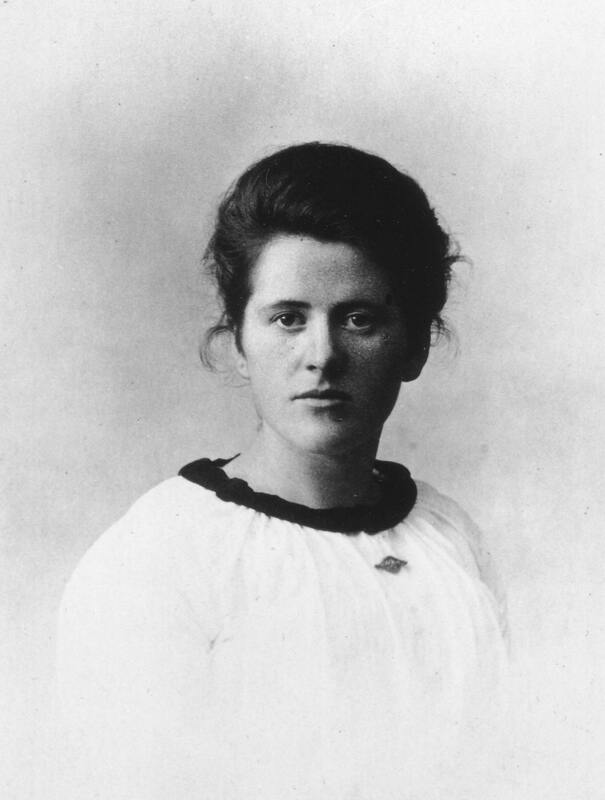 She was born there also and lived there during her whole childhood together with her parents and her brother Bertus. Although he was not rich, Johan still was in a position to buy the oil mill. Perhaps the mill in those days would not have been so very expensive any longer, as the mill had been closed down already. Corn was not ground any longer and also the oil mill was not in use any longer, although the wheels still kept on turning around. After all, the most important reason for Derk Jan Berenschot to purchase the mill was to eliminate a competitor. According to Thea, her father Johan did have the opportunity to buy also the corn mill, but he was not interested in that option. He just needed space to set up a home and to construct his workshops. Thea remarks: “Yes, of course, that little mill did not amount to much in the very beginning. The person who made a wonderful thing out of the place was my father.” Father Johan solidly fixed his part of the mill, building and renovating the mill and private house with determination. 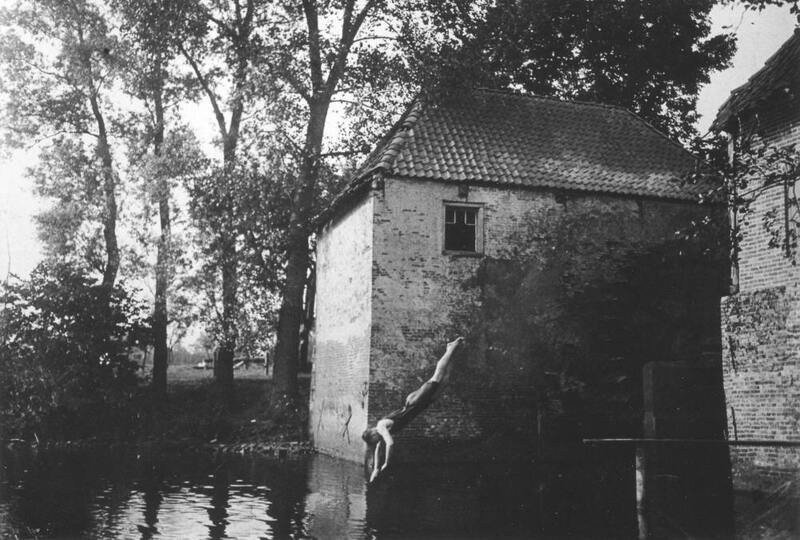 Mother Trui recognized that the place had potential: the vast pool behind the water mill would become Winterswijk’s first swimming pool and her husband Johan its first lifeguard. Water Mill Den Helder — At the mill’s pool a diving tower has already been constructed. At the end of the nineteenth century, the municipality of Winterswijk received a request to establish public baths. These sprang up in 1897 at the Badhuissteeg (a side street of the Spoorstraat) and were run privately. About 1907 the interest of people for the public baths decreased, perhaps as a result of rising costs. Many Winterswijkers preferred looking for refreshing recreation in the brook water of the Slinge. 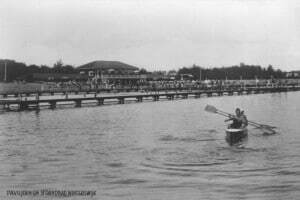 On the 18th of April 1910 – for the amount of 50 guilders – a parcel of land of 250 m² (0,061 acre) was bought from miller Barend Gerhard Heusinkveld by the municipality of Winterswijk. This plot of land was situated on the mill pool at water mill Den Helder. The municipality had the idea that it was possible to create here a swimming pool, although it would be a primitive one. Recirculation of the swimming water was no problem, of course, since the streaming river water would provide fresh water. The mill’s pool was in reach of the village by a walk of less than half an hour. There was already a swimming club in 1911, the WZV – the Winterswijk Swimming Club. This club put some changing cubicles along the pool and the mill’s pool was also protected against curious spectators by a fence. Because the swimming pool was only open for members of the WZV, a number of residents in 1913 tried to induce the local authorities to make it a municipal swimming pool. The local authority turned down the proposal partly in consideration of the small capacity of the pool. A similar request was brought forward on the 5th of June 1914 by city councillor J. Willink. 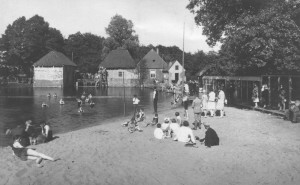 Willink also suggested granting a municipal subsidy in order that the swimming pool could be open more often. He also made a suggestion to enlarge the surface. The idea to create a municipal pool at Den Helder was rejected by the city council because this action would have excessive financial consequences. Nevertheless, at the council meeting of the 29th of October 1914, it was decided to grant a subsidy of 60 guilders. This amount was granted under the condition that nonmembers of WZV would also be permitted to make use of the swimming pool. In 1915 the local authorities decided to set up a committee that was commisioned to look for suitable swimming water. The gentlemen A.Th. ten Houten, J.Willink, and G.J.H. Bewernink were assigned to this committee. Three plans came up for discussion. The first plan included the concept of making swimming facilities upstream from Den Helder, because the Zwanenberg export slaughterhouse discharged its wastewater into the brook. The reservoir of the Pulsometer[3. Pulsometer: A pump without pistons that operates by means of pulsed condensation of steam. Also called vacuum pump.] could be converted into a bathhouse and swimming pool with a beach and beach pavilion. The HIJSM[4. HIJSM: Hollandsche IJzeren Spoorweg Maatschappij – Dutch Iron Railroad Company] however, was not cooperative, so that plan had to be abandoned. The second plan envisioned the use of heathland, situated along the brook and close to the little bridge at the path towards nursery Veldzicht in Kotten. However, the cost for the purchase of the land, for the excavation, and for a system to refresh standing water during the summertime caused the committee to have doubts that the town council would give its approval to this plan. Perhaps the third plan was the most obvious: adaptation of the swimming pool at Den Helder. Some suggestions were offered for this plan, but the town council thought the report to be too vague. They decided to ask the committee to work out more specific plans. Even though at Den Helder some improvements were made, it remained a rather primitive business. Occasionally the town council granted subsidies to the swimming club, but there still remained a deficiency of changing rooms and the supervision of the swimmers was considered to be inadequate. The swimmers quickly lost interest in the club, and in 1922 the club became defunct. After Johan te Selle purchased the oil mill, he introduced a lot of improvements. Gradually, in the pool behind the dam, a “real” swimming pool with a dock and diving board came into being. Johan himself was the pool attendant. He also invited the Aquatic Sport Club from Bocholt in Germany to come to Winterswijk to give demonstrations. 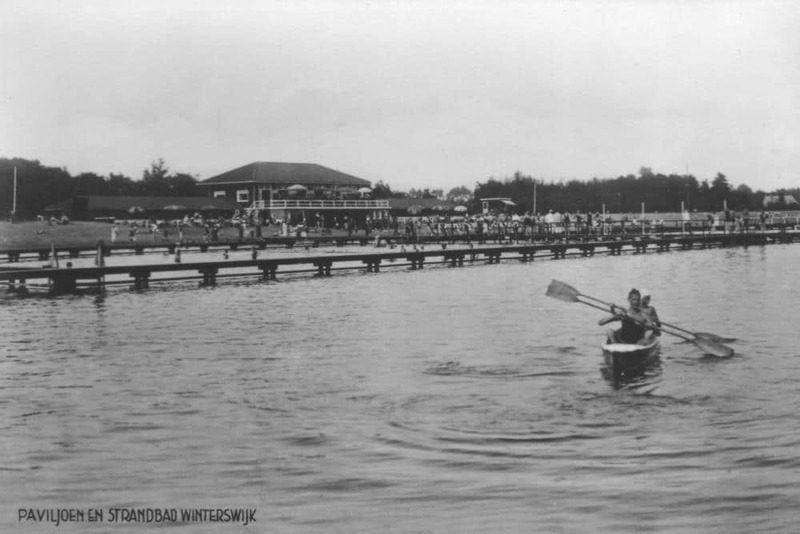 These activities lead to the foundation of the WWV, the Winterswijk Aquatic Sport Club in 1927. 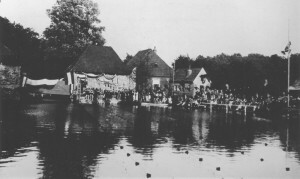 Real swimming competitions were organized in the pool behind the mill, which attracted a lot of spectators. Johan te Selle is the pool attendant. In 1933, when the new open-air swimming pool was opened, the pool at the water mill lost its function as a place where people went to swim. However, the efforts of Johan te Selle were not forgotten: in the pavilion of the new swimming pool he was assigned the food concession, and on the sand at the beach he ran a kiosk where confectionery, candy, and ice were sold. The new open air swimming pool of Winterswijk was constructed in 1933 as an unemployment relief project. As a result of Johan’s renovation activities, one part of the water mill changed in appearance and got a completely different complexion than the other part of the mill that he did not own. Nowadays he very likely would not have gotten such a free rein to create such a radical metamorphosis at the mill, but in those days no one lodged an objection. At the front he installed new gothic windows, and on the side by the mill’s pool, he installed big windows which provided a good view onto the pool. The windows at the terrace side very much resembled church windows. Thea still remembers very well the original condition of the mill and knows also that her father worked on the mill for a very long time. A lot of work was to be done. 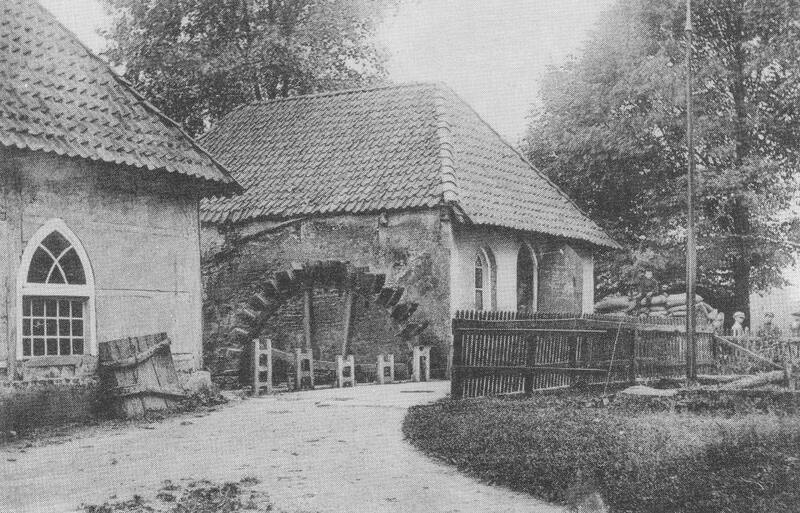 For his part father Johan removed the millstones, the driving wheels, and other miller’s equipment, whereas on the outside he left the mill wheel as it was. After all, he wanted to retain the original look of a mill. Some years later this wheel finally had to be removed, and many, many years later the wheel on the opposite side, too. By 1925 the character of the water mills has been changed in stages. About 1927 the wooden covering of the oil mill at the left side of the brook was replaced by brickwork. This image of Den Helder is called to mind by many generations of Winterswijkers when they think of this water mill. The oil mill is painted white, just like the corn mill, which has been fitted with a balcony/gallery along the water. Johan te Selle thoroughly renovated mill and private house and has established his lunchroom and ice-cream parlour. The corn mill structure got the already-mentioned “gothic” windows and was also enhanced with a balcony along the water. Johan painted the oil mill white. The corn mill, too, was white at first, but was later painted stone red. In Johan’s oil mill there was no cellar. All the grinding wheels and stones were located on the main floor. However, Johan wished to use the main floor for other purposes, so he carefully removed the grinding stones, drive shafts, and other milling equipment. Mother Trui, born on the farm “De Hutte”, is still a young girl when she loses both her parents and she becomes a housemaid at Scholte Tenkink in Het Woold. In 1923, when she marries Johan, they have to work hard to be able to make ends meet. For quite some time she does mending for families within the village. 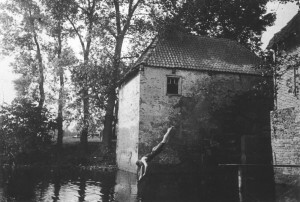 Johan builds a substantial house on the side of the water mill and a few workshops along the mill’s pool. Especially during the depression of the 1930s, he has to work long hours. 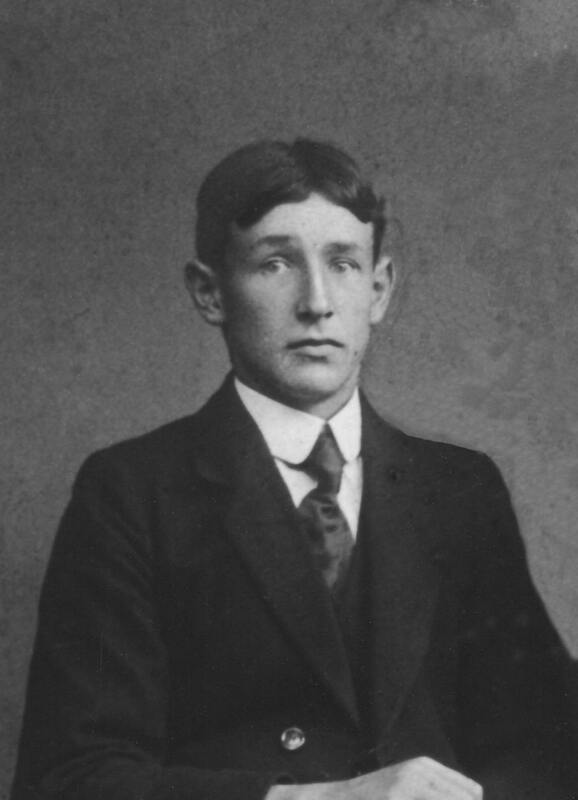 Johan’s brother Derk Willem (1888-1945), who is also a carpenter and contractor, has built farms in the surrounding hamlets for the amount of about four to five thousand guilders. Even in those days, those are unusually low prices, and he himself hardly earned good money. Derk Willem, however, is a socially-minded employer who is not only trying to keep his business running, but is also trying to protect his carpenters and bricklayers from unemployment. This picture shows the outside terrace of the lunchroom and ice cream parlour. The nameplate (J.C. te Selle) is displayed at the corner of the mill. The paddle wheel of the corn mill at the opposite side already has fallen soundly into disrepair. Note: Researcher Walter Knoop charts the countryside for the WCL-foundation. He is not only concerned about nature or agriculture, but also about the relation between the landscape and the buildings in there. And especially about the people in the country side who “have lived, worked and kept their nose to the grindstone there.” During his bicycle rides around Winterswijk he collected a great fund of information, for example about the surrounding area of the Slinge river. Outside the built-up area of Winterswijk, just a little south of the railroad to Doetinchem and Arnhem, the road to Woold, crosses the Slinge. In summertime when the water of the brook is low, yellow wagtails are hopping over the boulders along the eroded banks. Standing upon the Graas bridge in upstream direction two remarkable buildings are in sight/can be seen. Between them the dammed water of the Slinge murmurs down. The white painted building, situated far right has been renovated as a private house. This is the former oil mill, in which in those days the famous ice-cream parlour of Te Selle was established. Behind Te Selle nice little flirtation lanes were located around the Schot Schepers farm and it was not much effort to be missing for a shorter or longer period. Te Selle had a pretty daughter who attracted plenty of customers to the ice-cream parlour. Being served by her was already a treat in itself. In the other, red painted little building, in former times a corn mill was established. In the time between the two World Wars the exterior of both the former mills was changed considerably. Both mills were put out of operation and the paddle wheels were removed. The oil mill originally had a facing of vertically fastened planks, which later on was replaced by brickwalls. The pointed arch shaped windows which are still visible in the former corn mill date also from that period. Ice cream parlour Te Selle became famous for its wonderfully good ice cream quality. There was a lot of choice in types and flavours of ice cream. Therefore, during the summer season Johan’s staff had to work hard. The work in the ice cream parlour was typical seasonal work. During the summer months Johan and Trui were short of staff. 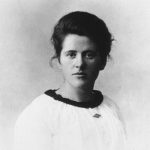 Thea says: “and in wintertime the ice cream parlour was locked up, so there really was no business at all — completely locked up, nothing happened” The business, however, flourished so well that Johan’s building activities for a while were put on the back-burner. The quiet months were especially used for giving all the chairs and tables of the ice cream parlour a complete check-up, and for renovating and retrieving materials. “A lot was done,” Thea says, “but nevertheless not in such a way that we could receive people.” It was also during these winter months that Johan sometimes began restoration work again for a shorter or longer period. 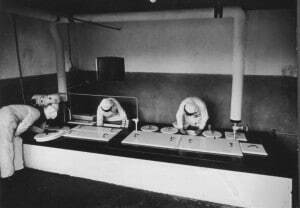 During the summer months, however, most of the work was done in the ice cream parlour. But what if Thea gets married and leaves Winterswijk in 1952? There would be no more heir in the family to run the business. 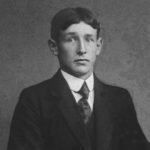 Brother Bertus, who had just passed the final examinations of his nautical college, died in April 1944 from the consequences of pneumonia. No antibiotics were available in that year of war. Son Geert, born in 1934, only lived for three weeks. The grief of both parents over the two sons they lost always remained profound. Johan and Trui moved to this summer house in 1957. In 1957 Johan and Trui sold their private house and ice cream parlour to Gerben Cornelius de Vries. They moved into the biggest of the summerhouses Johan had previously built as a workshop along the mill’s pool. The building was completely redesigned as a private house for the two of them. Johan and Trui stayed in this beautiful location for many years together. Eventually they moved to the Morsestraat in Winterswijk. Gerben Cornelius de Vries moved into the former private house of the oil mill. The ice cream parlour was also operated by the new owner. Even a new restaurant was built right against the house. 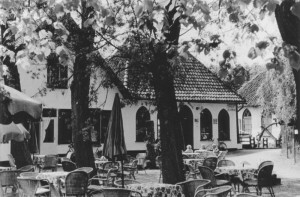 On the 2nd of July of that same year De Vries re-opens Café-Restaurant De Olliemölle. Johan, now 58 years of age, continued in his former profession as a carpenter. He could not sit still! He did considerable work for the National Trust for the Preservation of Monuments and Historic Buildings and traveled throughout the Achterhoek. He was a much sought-after craftsman, who also assisted in Arnhem in the subsidized restoration of old buildings. Although he still was a self-employed person, he no longer had a big workshop at his disposal. The workshops had been sold or redesigned. From then on he used the workshops of the National Trust. Until his death in December 1970, Johan was still going strong in the restoration business. A fall from the ridge of a building in Winterswijk – also being restored – proved fatal to him. 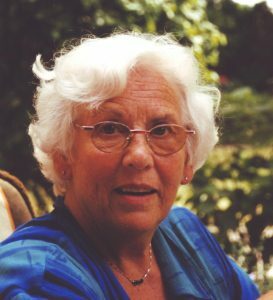 Mother Trui became a “monument” in the Te Selle family in Winterswijk. Even in her old age (she lived to be almost 92) she was a “good-looker”. She made an appearance at all important family gatherings and did not miss any available opportunity to stay informed about the news and activities of all family members.